Abcam's Gold Conjugation Kit allows antibodies or proteins to be covalently attached to ultra-stable GOLD nanoparticles at very high OD quickly and easily. The hands-on time for the Gold Conjugation procedure is about 2 minutes and the conjugate is ready to use within 20 minutes. 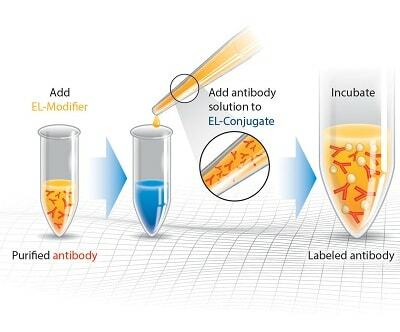 The 3 and 10 Test Conjugation Kits are designed to label 12 µl per vial. The 1 Test Conjugation Kit is designed to label 120 µl per vial. ab154876 has not yet been referenced specifically in any publications. Publishing research using ab154876? Please let us know so that we can cite the reference in this datasheet. I have some questions about the Gold-biotin Easylink kits. 1) Is the biotin already conjugated to the gold? 2) Can I dissolve this in PBS with serum? Or is serum not advised? 3) I have used a smaller gold particle for my lateral flow assay before and seen low signal to noise ratio, does a larger size particle improve this? We have never tested the Biotin-GOLD with serum (PBS is fine) but they should be stable thanks to the coating.Yes, we have experienced in our LFA that bigger nanoparticles have an improved signal to noise ratio.